Jim Fox, part time stacks coordinator with Access and User Assistance, retired on April 30 after more than 13 years of service. Jim began his time at Falvey working as a microfilm supervisor, overseeing the use of the microfilm machines and supervising the students who worked in the Bound Periodicals Stacks. When the library underwent renovations, Jim was reassigned to Access and User Assistance and assumed the position of part time stacks coordinator. Jim’s new duties expanded to include Interlibrary Loan. After earning his bachelor’s degree from Villanova University in 1958, Jim taught history at Upper Merion High School until his retirement in 1996. Following retirement Jim returned to the University to work in the library. 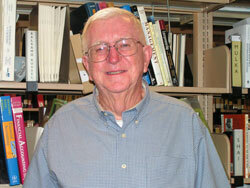 He also taught history at LaSalle University, Penn State University and Neumann College. Jim’s loyalty to the students, the library and the university was unmatched. He had a knack for connecting with the students, and they were Jim’s first priority. He loved hearing their stories and would frequently quiz them on University history or engage them in conversation about Villanova basketball or football. 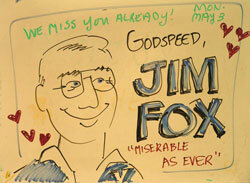 Jim was a true asset to Falvey Memorial Library. He performed many necessary tasks that required a great deal of stamina as well as technical skill. When asked, “Hey, Jim. How are you doing?” he would always answer, “Miserable as ever!” but nothing could be further from the truth. He performed his duties without complaint and never failed to miss an opportunity to show an interest in each one of us. Jim’s retirement will allow him to spend more time with his wife Teresa, his children and grandchildren. Article and photo by Laura Hutelmyer. Whiteboard art by Joanne Quinn. A great guy who will really be missed!